The weather, the nature, everything has been so incredibly gorgeous lately. I adore spring, how it's just warm enough to lose those heavy coats, but chilly enough to still rock different jackets, that make such difference when it comes to styling an outfit. Not to mention the blossoming trees on every corner that create almost a magical atmosphere, making me wanna spend as much time outside as possible! The weather looks gorgeous. And this is the perfect spring evening outfit. Love it. 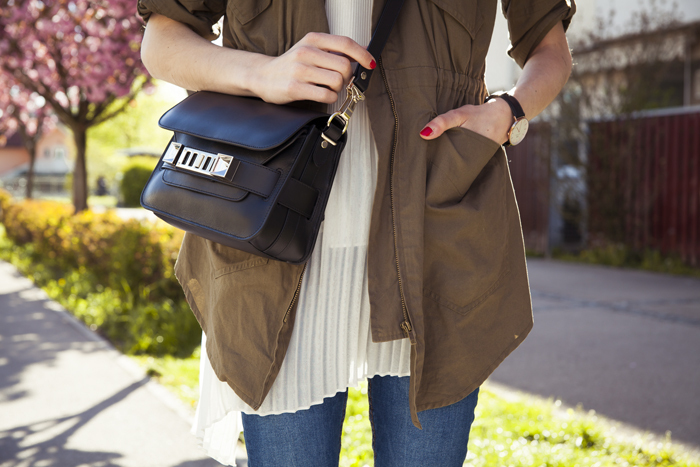 Fantastic jacket and bag! You look great in this casual outfit! Gorgeous, these pictures are so pretty! What a cute top!